This kit is packed with everything need to make ten delectable Italian cheeses. Just add milk! 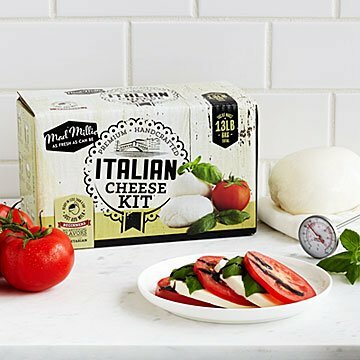 Packed with the tools and ingredients needed to make 10 delectable batches of Italian cheese, this kit allows you to turn your kitchen into a fully functional cheese shop. Just add milk! In a few hours, amateur cheesemakers can whip up batches of their favorite artisan cheeses, including mozzarella, ricotta, mascarpone and ricotta salata. The kit includes real cheesemaking culture and 100% vegetarian rennet, so your dairy-based creations will stand up to any taste test without the addition of unsavory chemicals or preservatives. The kit, including all the equipment and ingredients enclosed, is made in Auckland, New Zealand. Makes up to 10 batches of cheese. I Purchased many items for the grandchildren for Christmas, enjoyed it and look forward to your paper catalogs. I primarily purchased this to make mozzarella. I have tried it 3 times and it has failed. I am following the directions and watched the video. The process seems to start well , I see curds forming but as it gets closer to 32C it seems to mainly turn to water. After I add the rennet and let it sit for 25-30 minutes it is basically water. I am using whole milk. I really want this to work - my son asked if I could make him burrata and I had to laugh. So far I can't make anything. I want to try all of Mad Millie's kits! Great beginner gift! The kit comes nicely packaged with easy to follow instructions. It is a great value! I will be repeat customer for sure! It was a Xmas gift the recipient loved it! Whereas this was a Christmas gift and today is the 27th, I'm sure they haven't tried making cheese yet, but are very excited to do so. I'm excited to see how it all works out and I hope they share! :) I'd never seen anything like it and just knew they'd enjoy trying it. This was a fun holiday gift to go with a cheese board/kitchen items. Looks great so far but haven't tried making the cheese yet. Secret Santa gift for a cheese lover - she loved it! This product was excellent and the directions were very clear and easy to follow.